Turn an ordinary room into a modern, bright, living environment with the introduction of bi-folding doors and windows, within seconds a room can be transformed to create an impressive space to entertain or a place to simply relax with friends & family. Opening with ease, in mere seconds, they will enhance your lifestyle by offering unobstructed panoramic views and access to the garden, making them irreplaceable. 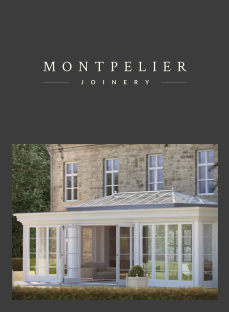 Open your Montpelier bi-folding doors on an early summer morning and enjoy that magic time when a certain stillness precedes the day. Whilst in the winter, our Argon filled glass coupled with under floor heating will provide the best seat in the house as the garden hibernates in the grip of winter. The Argon filled double glazed sealed units are a must, as they provide a barrier to reduce heat transfer, keeping the building cool in summer and warm in winter therefore giving you a room that you can enjoy all year round. As with our range of windows and doors, we use solid Timber throughout to ensure both the most beautiful fit and finish together with a lifetime of satisfaction and enjoyment. Timbers natural resistance to shrinkage and swelling, coupled with our innovative track system set flush with the floor, ensures the opening and closing of even the widest set of bi-folds is effortless.